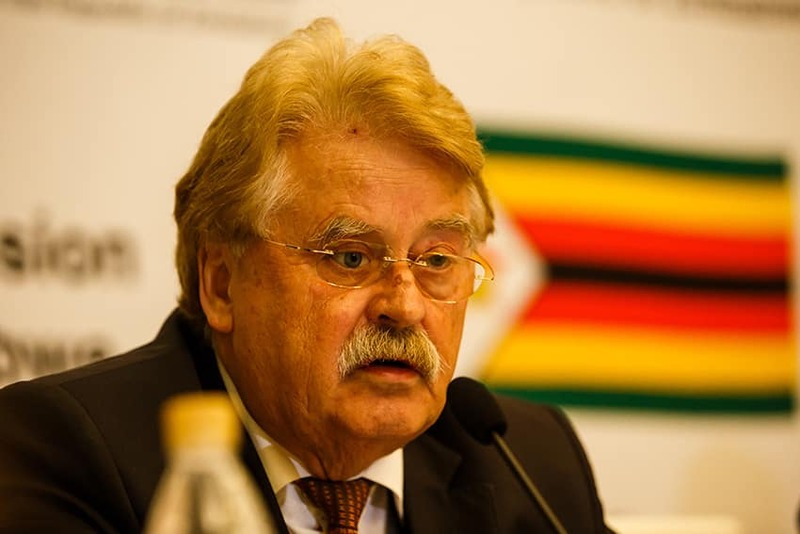 Elmar Brok, Chief Observer of the European Union Election Observation Mission (EUEOM) to Zimbabwe speaking at a pres conference in the capital Harare, July 6 2018. The European Union Election Observation Mission to Zimbabwe (EUEOM) has challenged government and the Zimbabwe Electoral Commission (ZEC) to work towards creating a transparent environment that ensure the country holds credible polls on 30 July. In an exclusive interview with 263Chat in the capital today, EUEOM Chief Observer, Elmar Brok advised ZEC to be transparent in-order to gain confidence of the electorate especially on the role of the military in elections. “It should be clear, I don’t know the figures and I would advise that ZEC should publish the figure which shows the military has so that we can see whether this has a strong influence. But I would advise it should not have a strong influence. “Therefore, I believe that the role of the military action in this election, because of history, it would be against the credibility of this election,” he said. Brok called for a clear military conduct that satisfies all political stakeholders to establish confidence among the people. Earlier in his press briefing, Brok said Zimbabwe’s history of contestable election outcome calls for solid improvements to level the electoral ground. “Given the context of past contentious elections, great efforts need to be made to ensure public and political confidence in the 2018 polls. “In this regard, enhanced transparency and inclusivity, confidence in the integrity of the voter roll, the peaceful conduct of the polls and an environment whereby voters are truly able to express their will and cast a vote in secret are imperative,” he said. “But I feel it is important to stress that in addition to the technical management of the process, great efforts need to be made to ensure transparency and inclusivity, enhancing the confidence of all stakeholders in the credibility of the preparations. At the end of the day elections are both a technical and political exercise and so the confidence and trust of political stakeholders needs to be an important consideration,” added Brok. The EU election observer team has been in the country since the 6th of June 2018. They are already moving around the country assessing the environment ahead of the 30 July elections.